OUR MISSION VISION: "A world where everyone has a decent place to live." OUR MISSION: "Seeking to put God’s love into action, Habitat for Humanity brings people together to build homes, communities and hope." In an effort to provide decent and affordable housing to low-income families, in partnership with God, the partner families and our community Habitat for Humanity of the Greater Wenatchee Area is part of a global, nonprofit housing organization operated on Christian principles that seeks to put God’s love into action by building homes, communities and hope. 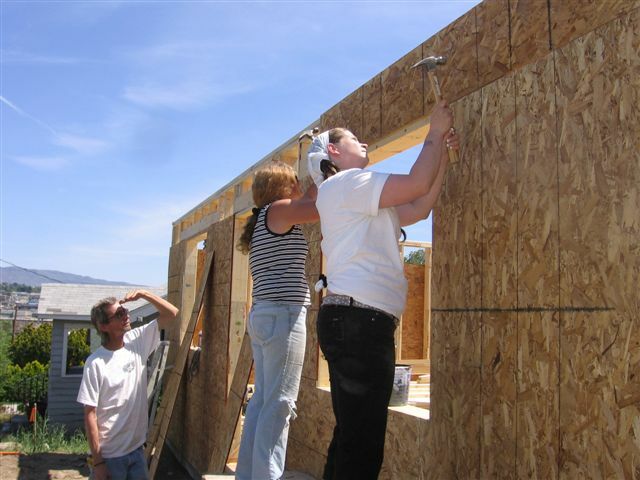 Habitat for Humanity of the Greater Wenatchee Area was formed in 1990 by a group of community-minded citizens who saw the need for decent, affordable housing in this area and is operated by volunteer Board of Directors comprised of members of our community. Local affiliates are independently responsible for fundraising, family selection, home construction,﻿ volunteer coordination ﻿and all operational functions. Habitat for Humanity of the Greater Wenatchee Area has an open-door policy: All who believe that everyone needs a decent, affordable place to live are welcome to help with the work, regardless of race, religion, age, gender, political views or any of the other distinctions that too often divide people. In short, Habitat welcomes volunteers and supporters from all backgrounds and also serves people in need of decent housing regardless of race or religion. As a matter of policy, Habitat for Humanity International and its affiliated organizations do not proselytize. This means that Habitat will not offer assistance on the expressed or implied condition that people must either adhere to or convert to a particular faith, or listen and respond to messaging designed to induce conversion to a particular faith. The cities of Wenatchee, East Wenatchee, and within a 5 mile radius of the city limits make up the Greater Wenatchee Area. The population of this area is approximately 70,000 people. It is one of the leading fruit growing areas in the nation. Habitat has been able to provide housing for many families currently living in substandard housing who qualify under Habitat for Humanity family selection guidelines. The housing conditions in south Wenatchee, a multi-cultural and low income area, have been targeted by the city and by Habitat for Humanity as an area that is in great need of improvement. Habitat has built a number of homes in south Wenatchee since its inception in 1990. By the end of 2016 Habitat for Humanity of the Greater Wenatchee Area has built 53 homes providing safe, decent and affordable housing for more than 200 individuals, the majority of whom are children. Habitat homes are modest in size and materials and are constructed according to specific guidelines assuring affordability. Homes are sold to qualifying low-income families at cost with a 25-30 year affordable mortgage. Because volunteers and the families provide nearly all of the labor on the home, the cost is much lower than for conventional housing. The city of Wenatchee presented a "Community Development Award" to our affiliate in 2001, for "organizing and carrying out a quality program to provide housing for our community". The Mayor and City Council presented this award to our Board of Directors.